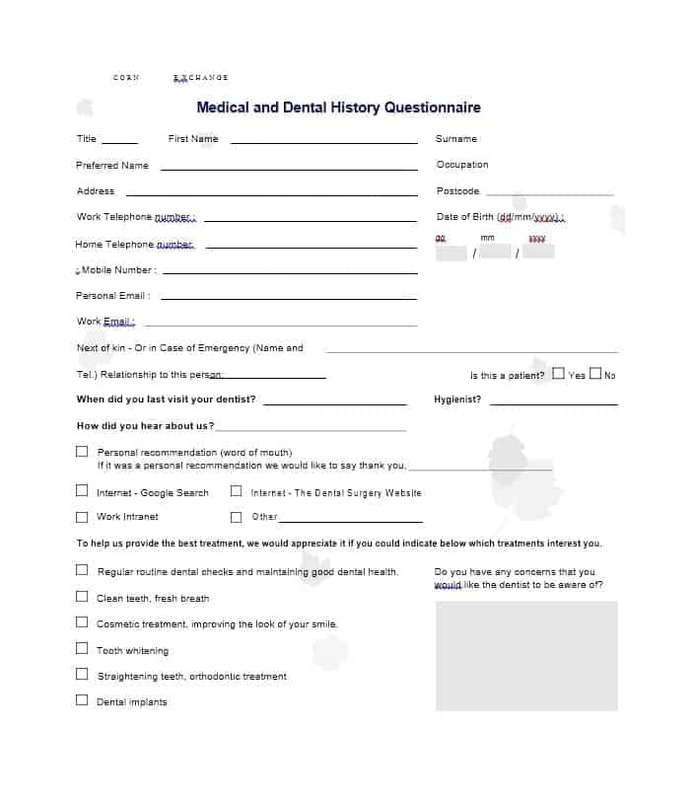 A health history questionnaire is a document filled by doctors and is used whenever a patient first visits a medical institution. 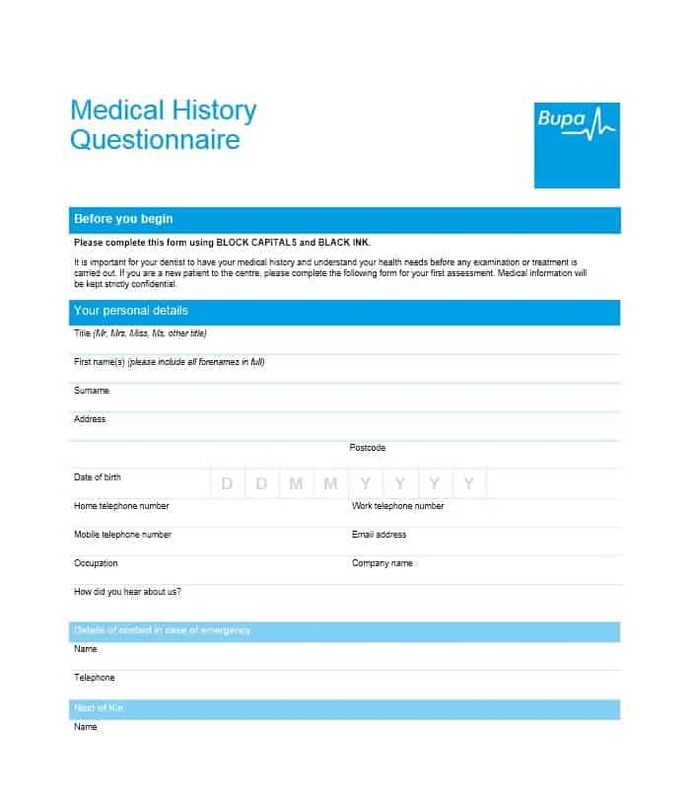 The main purpose of a medical history questionnaire is to find out about a patient’s health history and get an idea of his/her health. 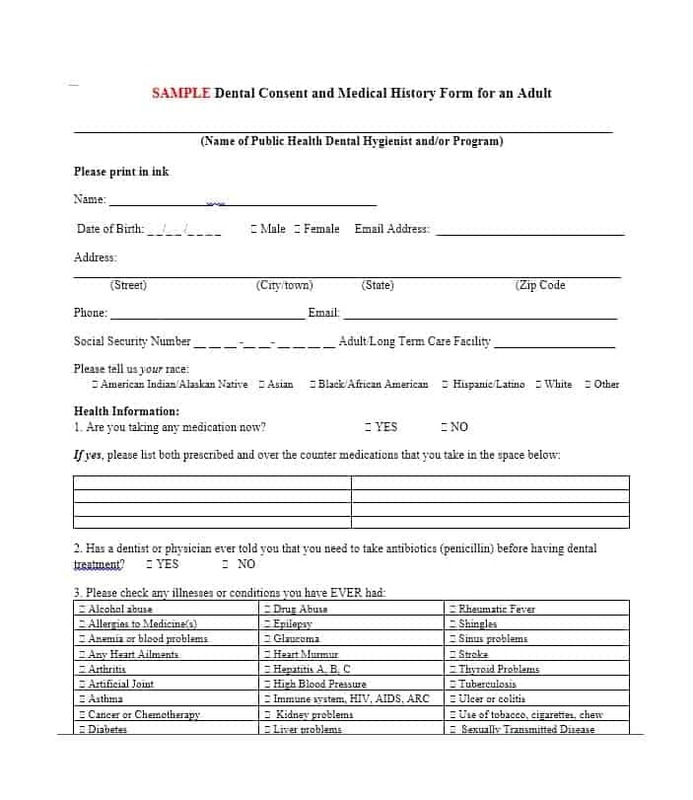 In addition to the above, the personal/general health section of the health history questionnaire lists down childhood illnesses, such as Chicken Pox, Measles, Rheumatic fever, Mumps, Rubella etc. 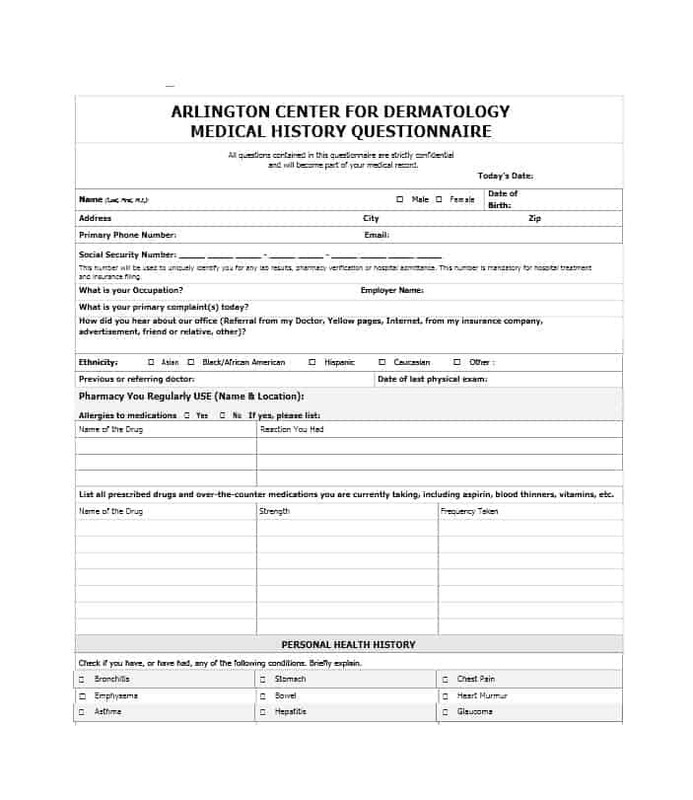 Additionally, this section contains medical illnesses such as Asthma, Bleeding Disorder, Gout, Heart disease, diabetes, generic defects, hypertension, severe infections, Osteoarthritis etc. as well. 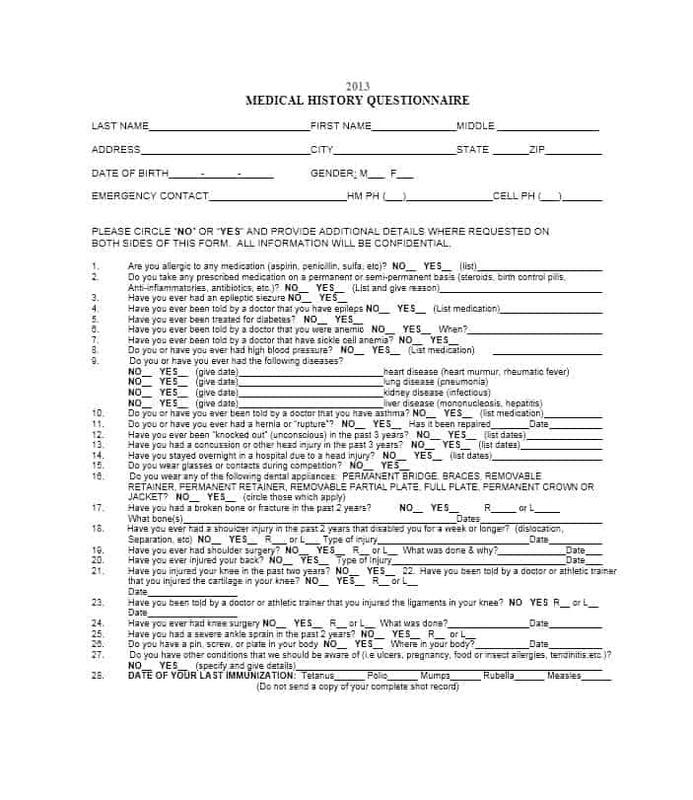 In addition to the list of things mentioned above, other information is also included in a medical history questionnaire. 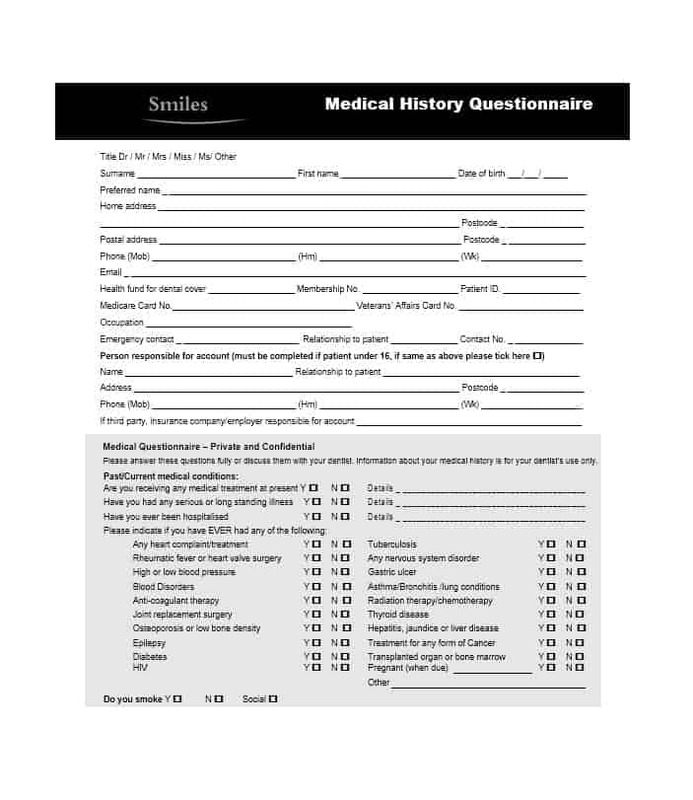 A good way to find out about them is by taking a look at a medical history questionnaire template. 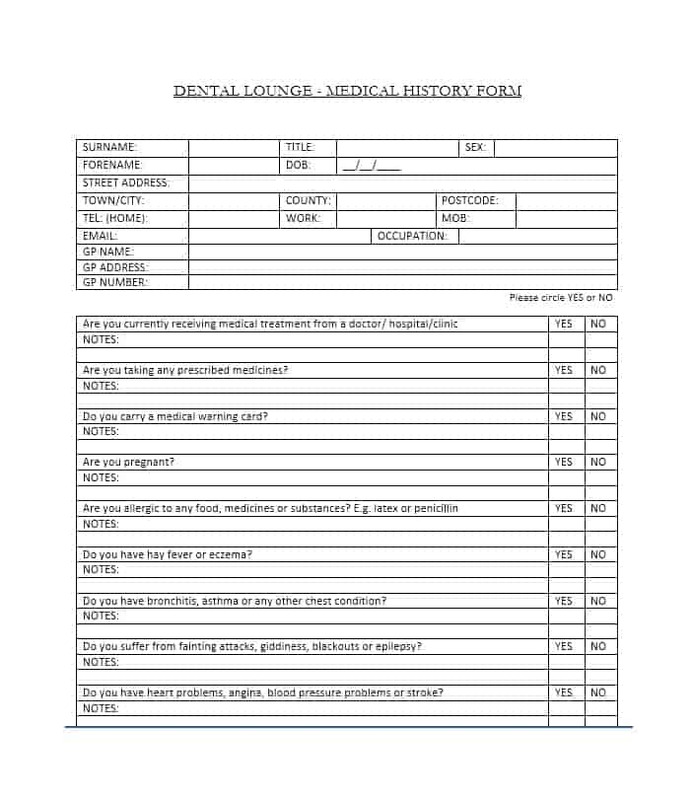 Talking about templates, you can create an appropriate medical release form by taking a look at a medical release form template. 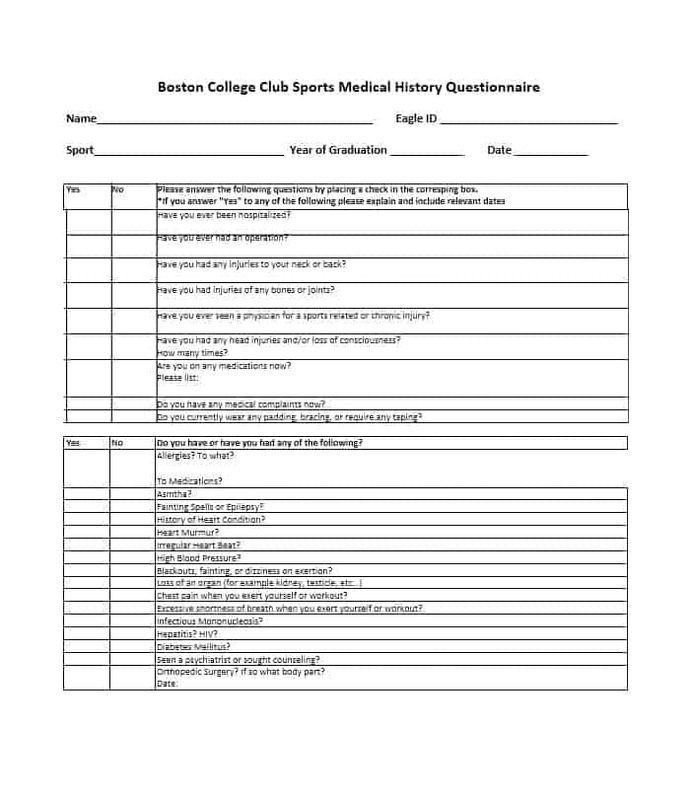 Coming back to the topic at hand, not many people argue of the importance of a health history questionnaire. 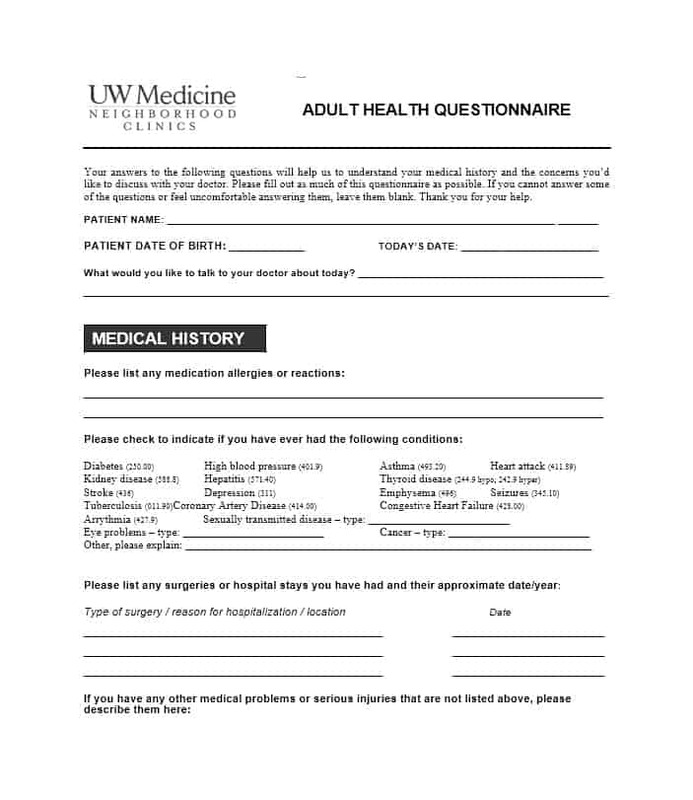 The reason for this is simple: medical history questionnaires have proven their significance and utility in physician practices and medical studies. 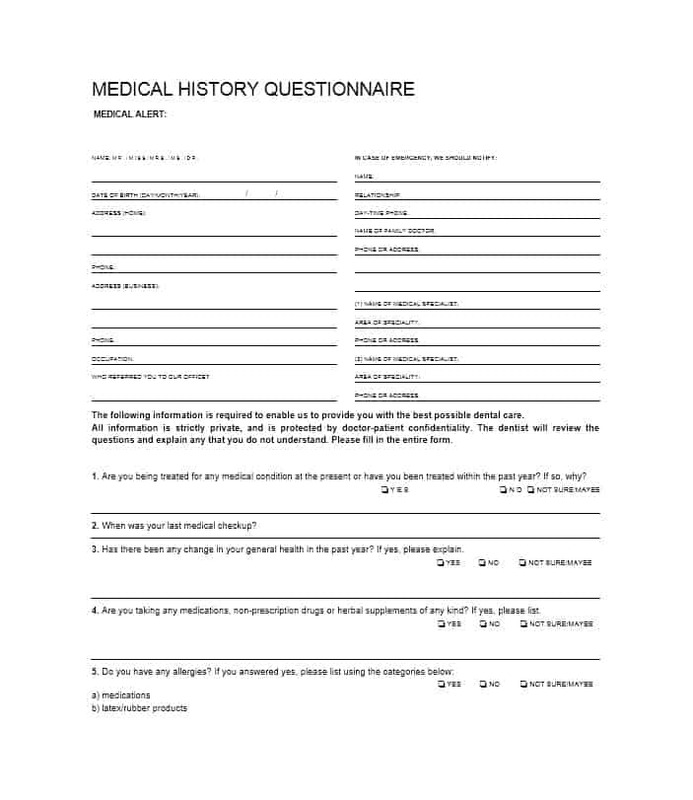 A medical history questionnaire helps a physician record and document the use of medication, surgery, and the illness history of a patient precisely and accurately. 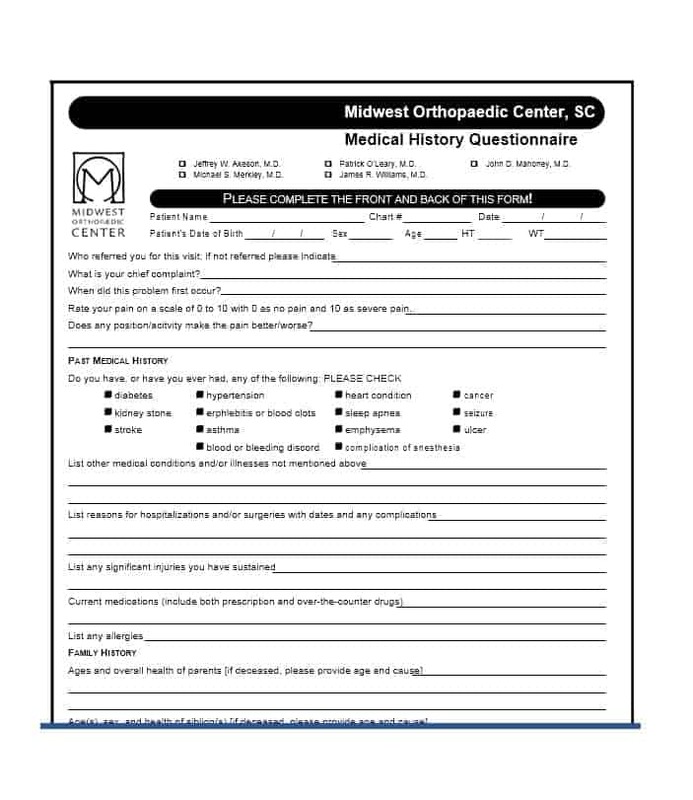 In addition to helping the physician in his/her practice, the health history questionnaires can be utilized significantly in various medical studies if they are properly and accurately filled by the patients. 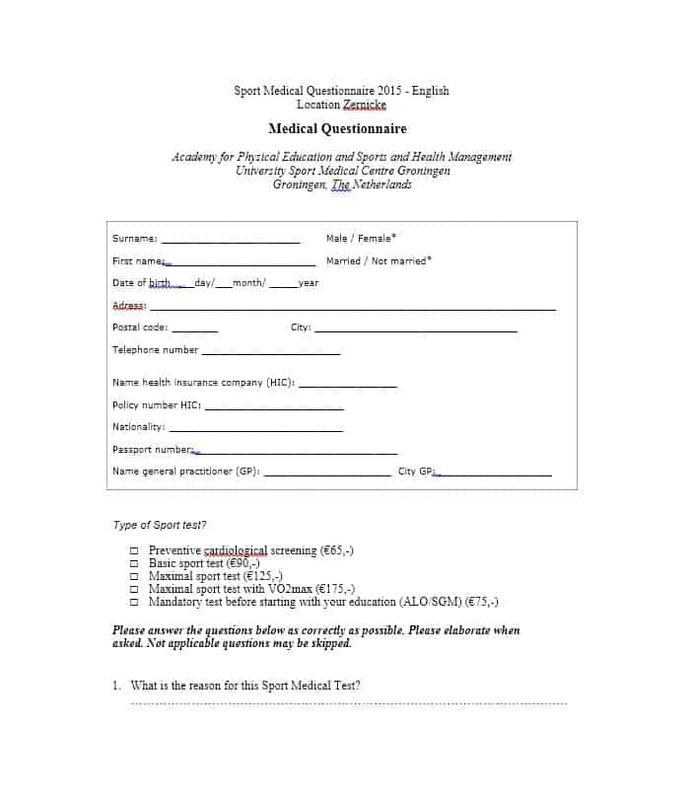 Though there are no set questions to include in the medical history questionnaire, the aforementioned information must be part be of the questionnaire. 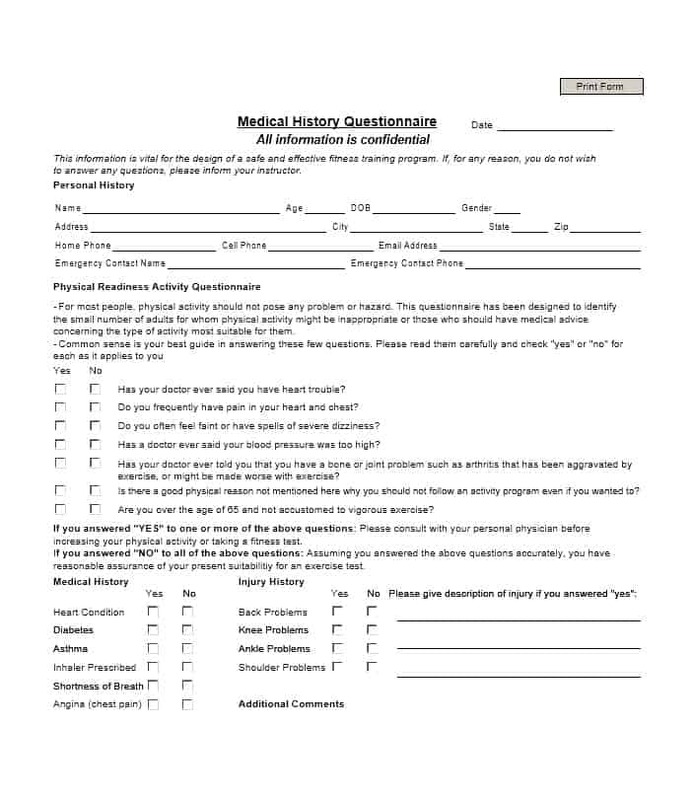 At times, a healthy history questionnaire may be referred to as a family medical history questionnaire. 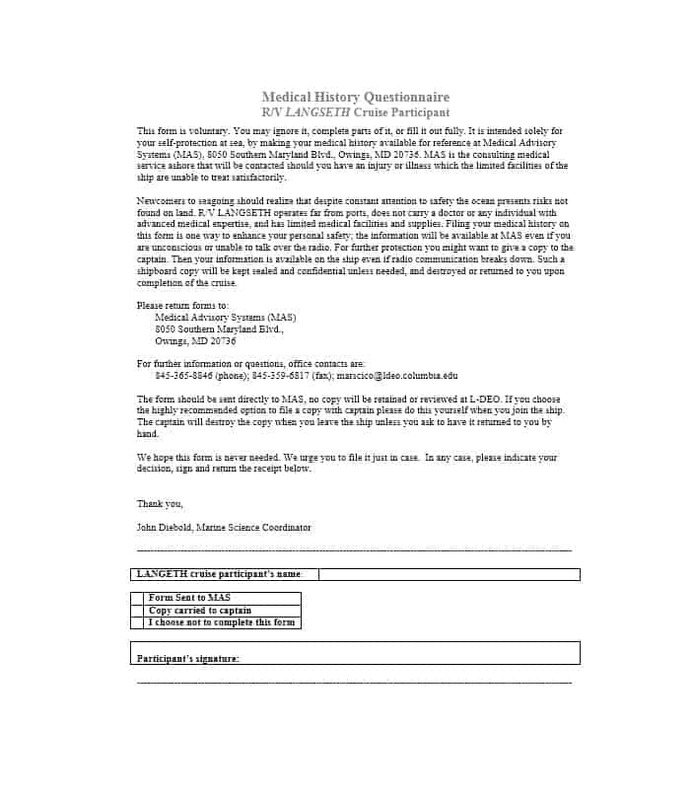 Now, let’s discuss the health history questionnaire in a bit more detail. 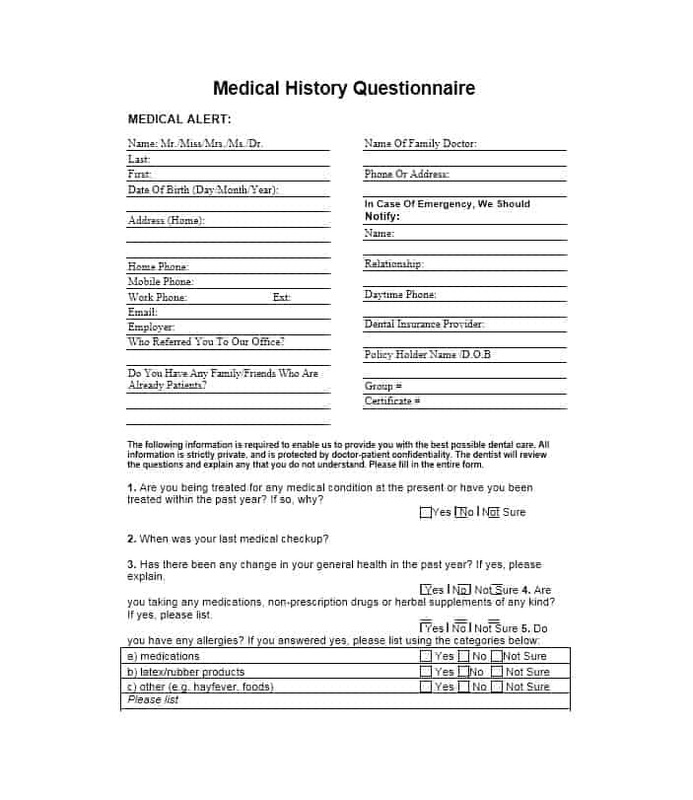 A health history questionnaire reveals everything that’s part of a patient health history. 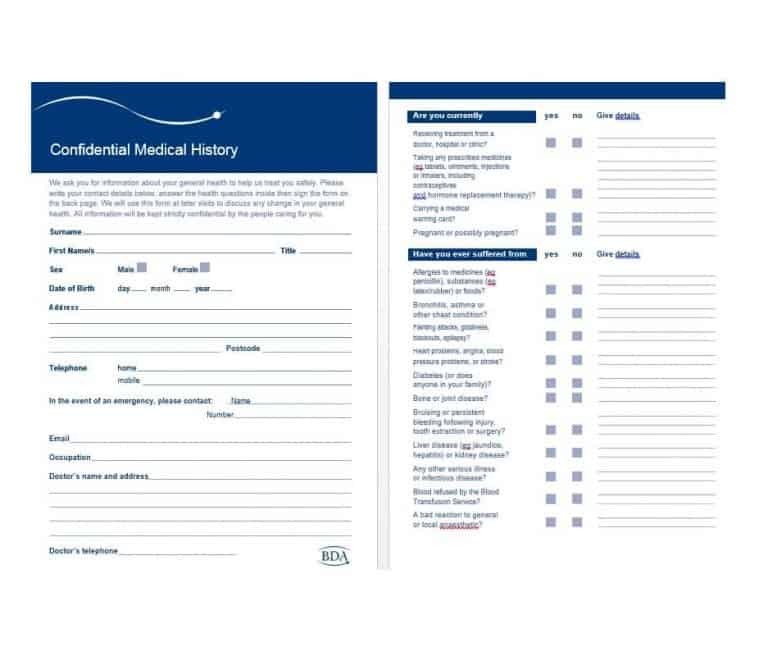 What is a patient’s health history? 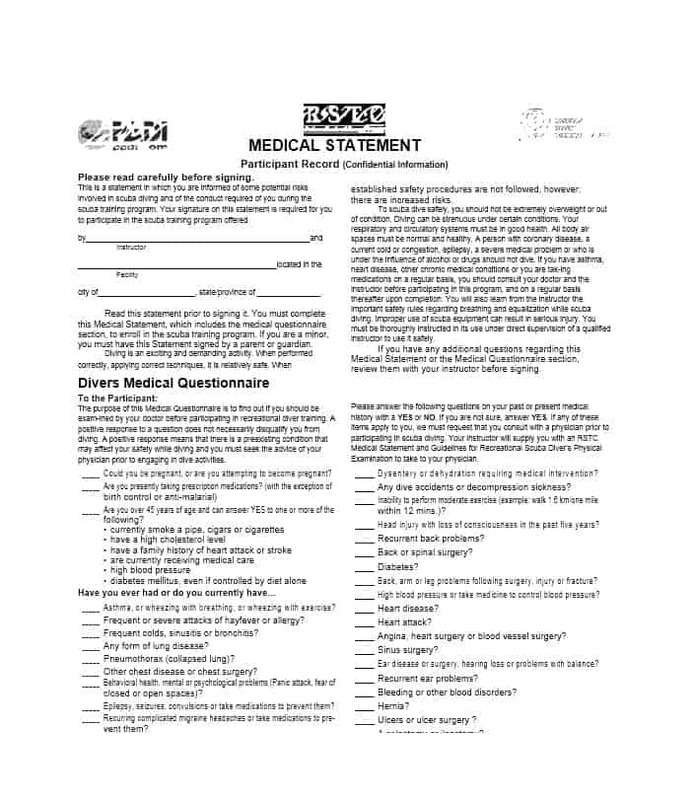 Simply put, it’s a comprehensive appraisal of all factors affecting the health status of a patient. 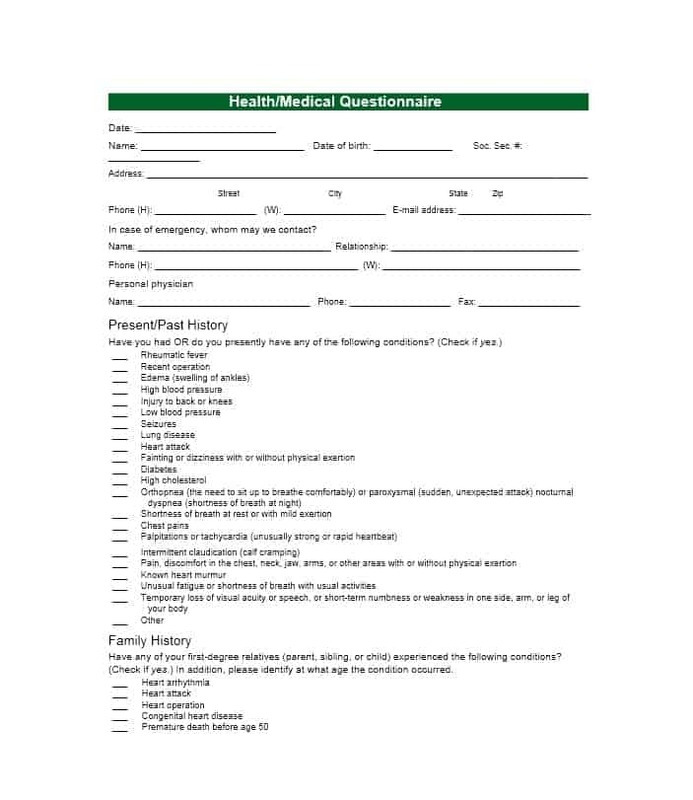 The medical history questionnaire reveals information related to the economic, familial, cultural, and social aspects of a patient’s life. 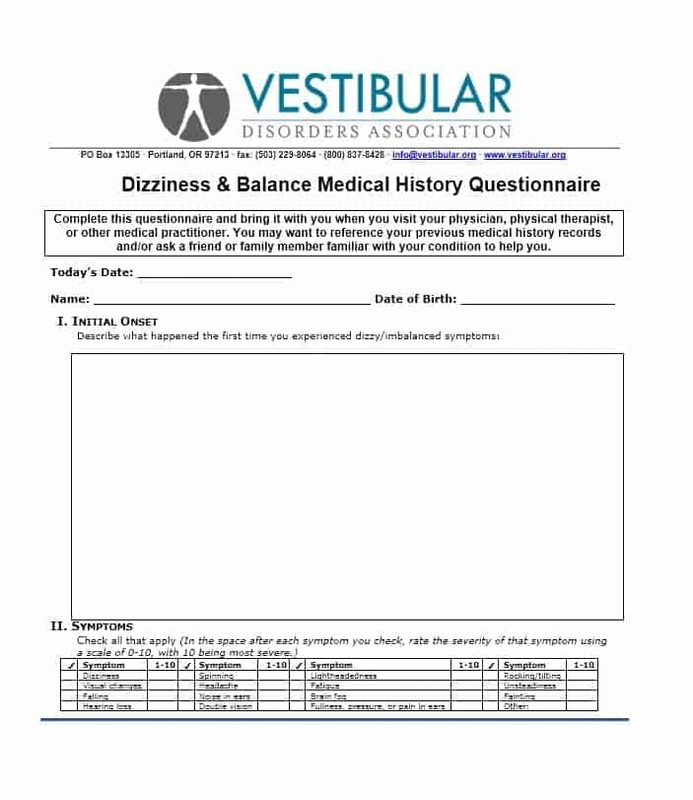 Additionally, it shows the lifestyle of the patient and how it may affect his/her health and well-being. 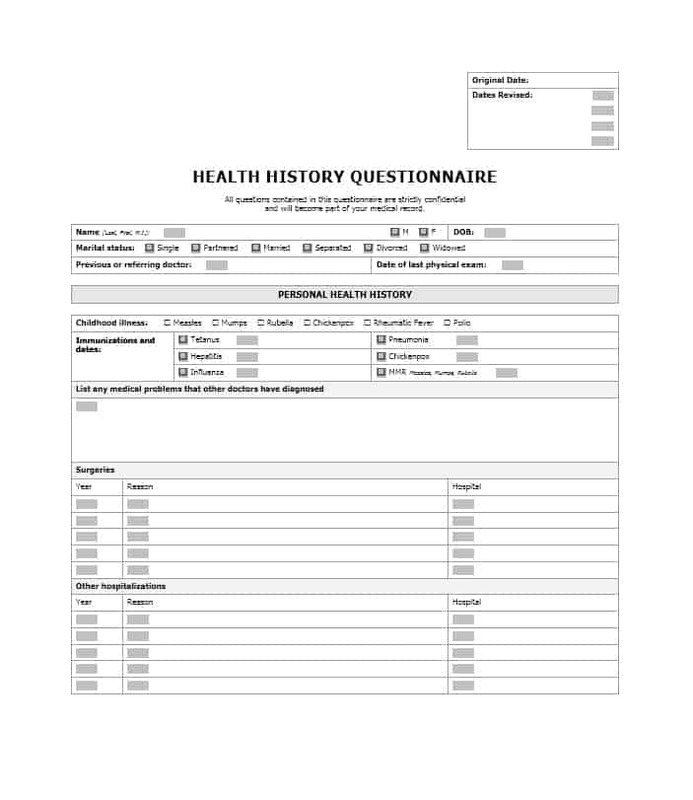 The purpose of designing the health history questionnaire is to see how a patient’s health has changed over the years so that an appropriate, individualized wellness and treatment plan can be designed for him/her. 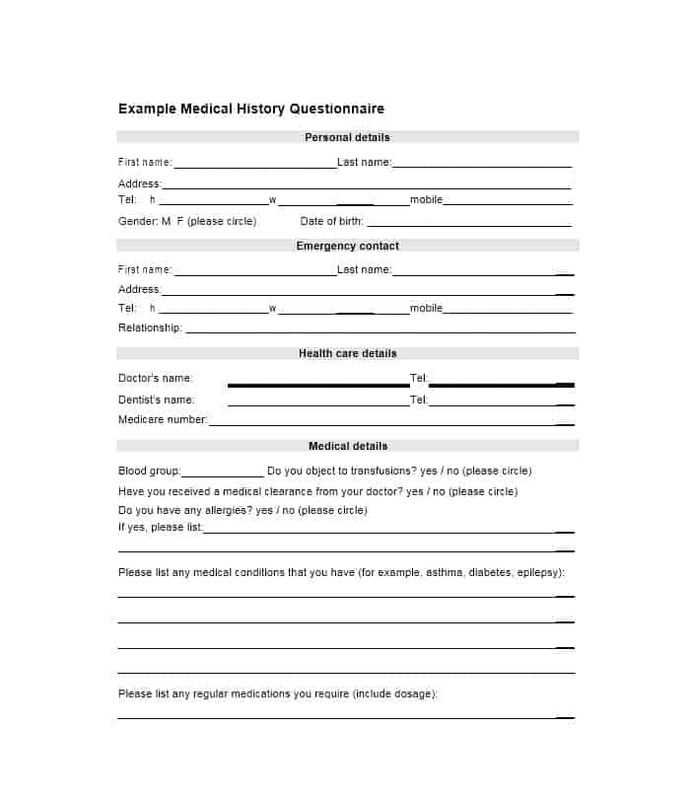 Following is the definition, purpose, and description of a medical history questionnaire. 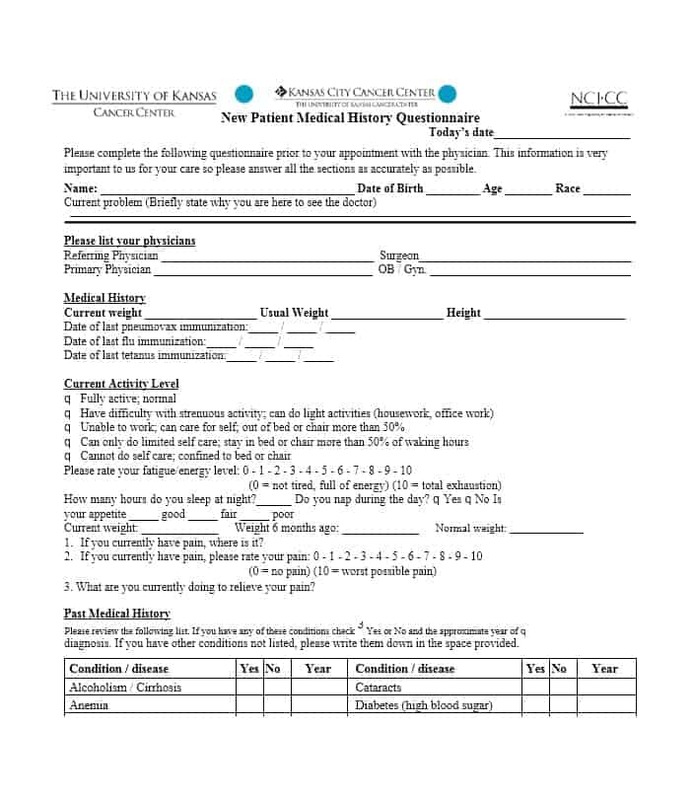 A collection of information unique to the patient is what a patient’s health history refers to. 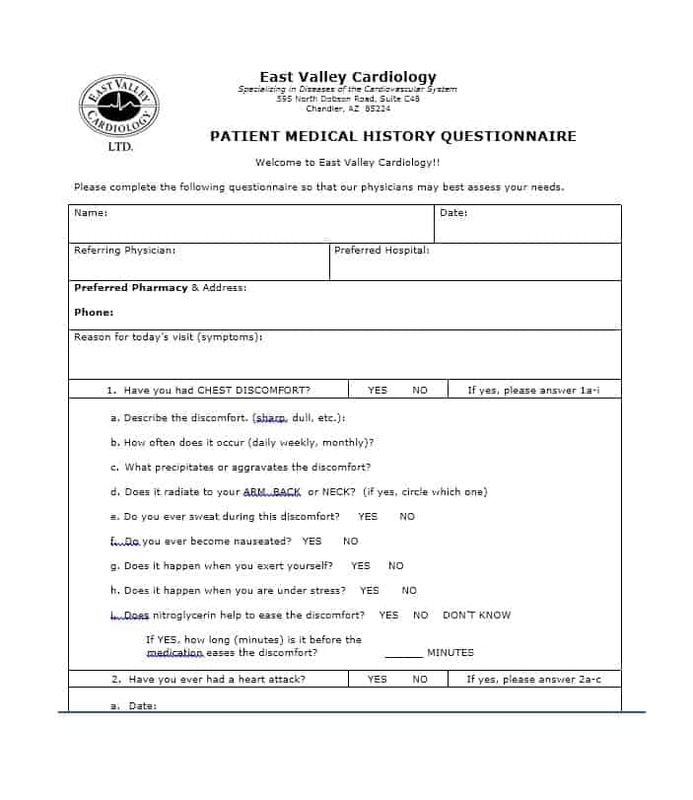 All relevant history of a patient, including physical, bipographical, emotional, mental, demographic, spiritual, sexual, and socio-cultural information is part of a patient’s health history questionnaire. 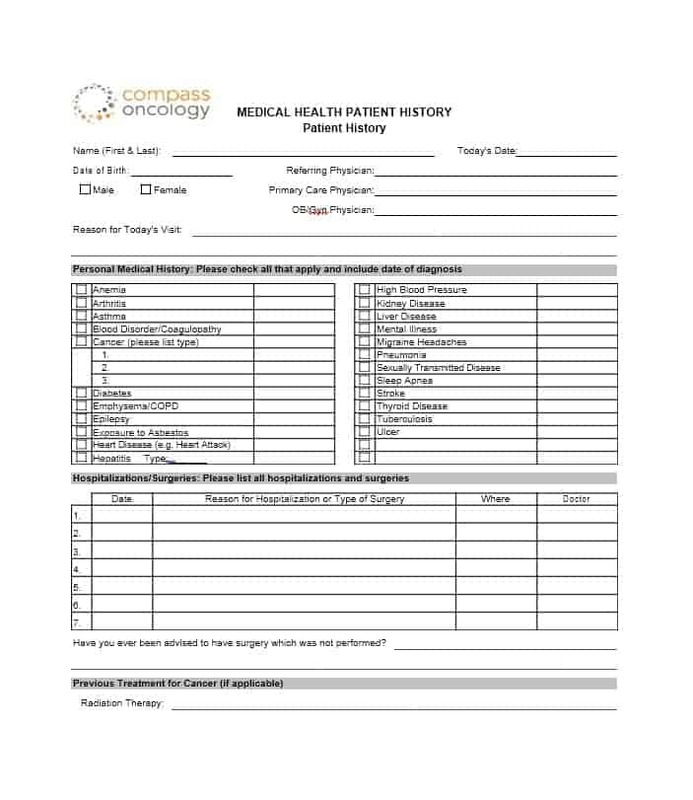 By providing them useful information that aids diagnosis, the decisions related to treatment, and the building of rapport and trust between the patient and the medical practitioners, the medical history questionnaire helps both the patients and the healthcare providers. 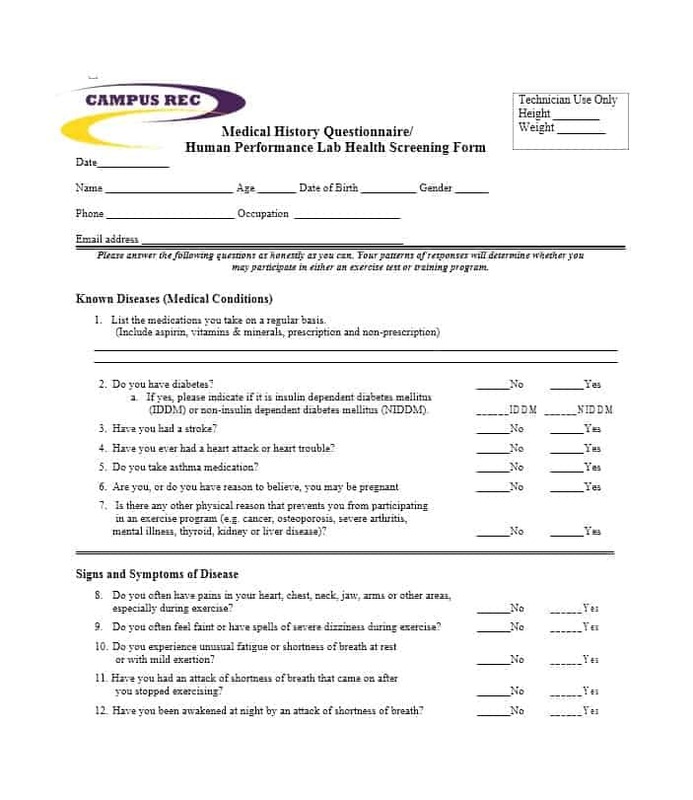 The information provided in the health history questionnaire helps doctors determine the baseline of a patient and what’s normal for him/her. 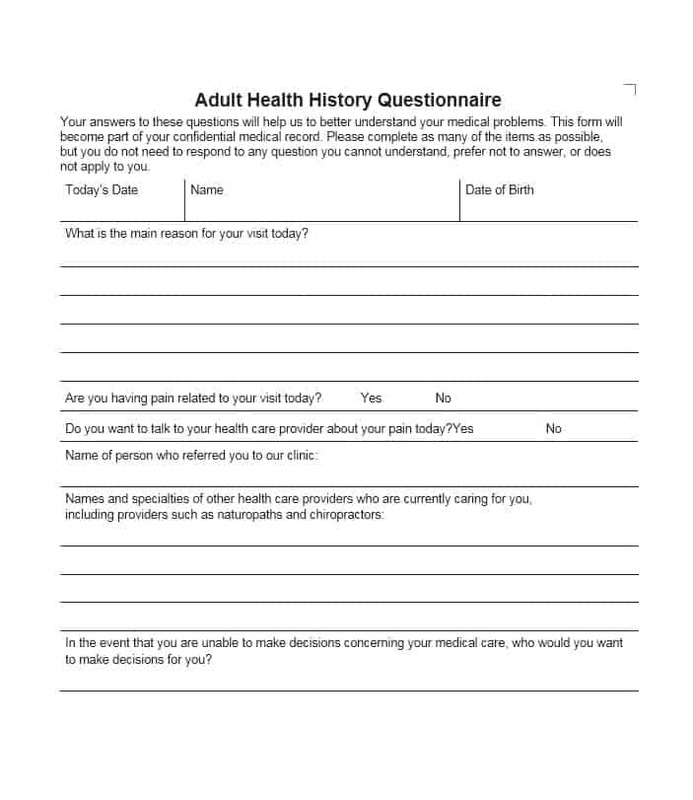 The use of a health history questionnaire is one of the most common methods of obtaining a patient’s health history. 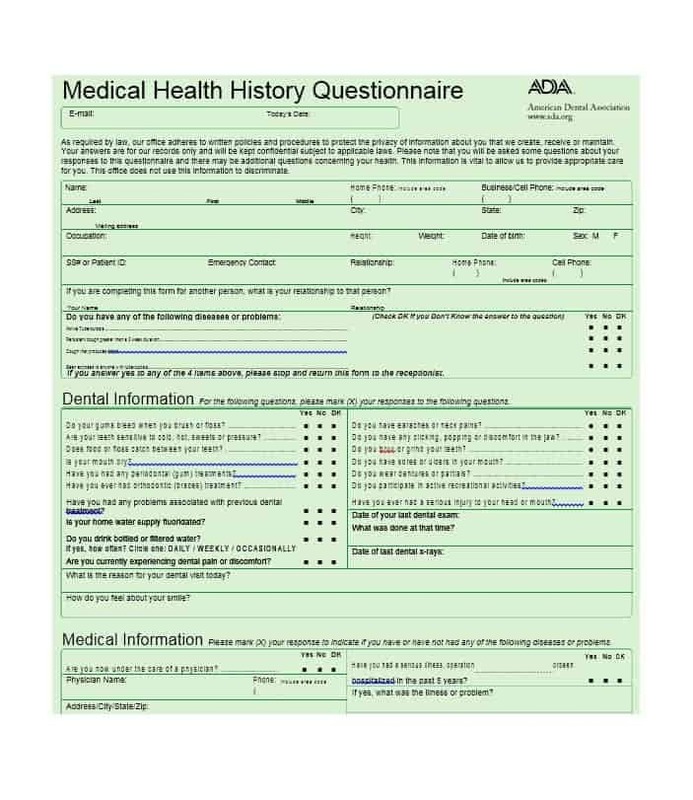 In fact, a medical history questionnaire is the best way to obtain a person’s health history if the person in question is able to communicate effectively. 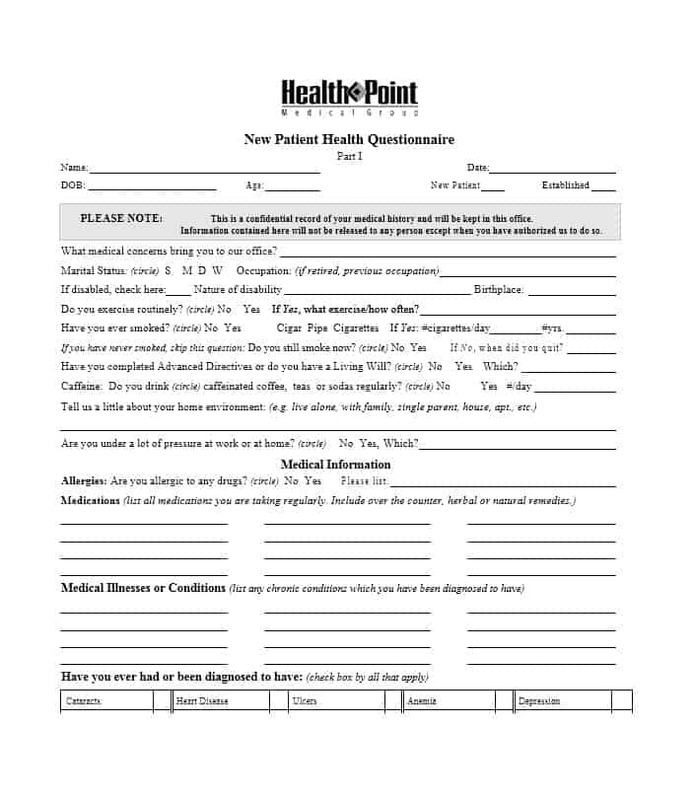 The person or patient in question can provide the relevant information by using his/her previous records, or by contacting previous doctors and other healthcare providers. 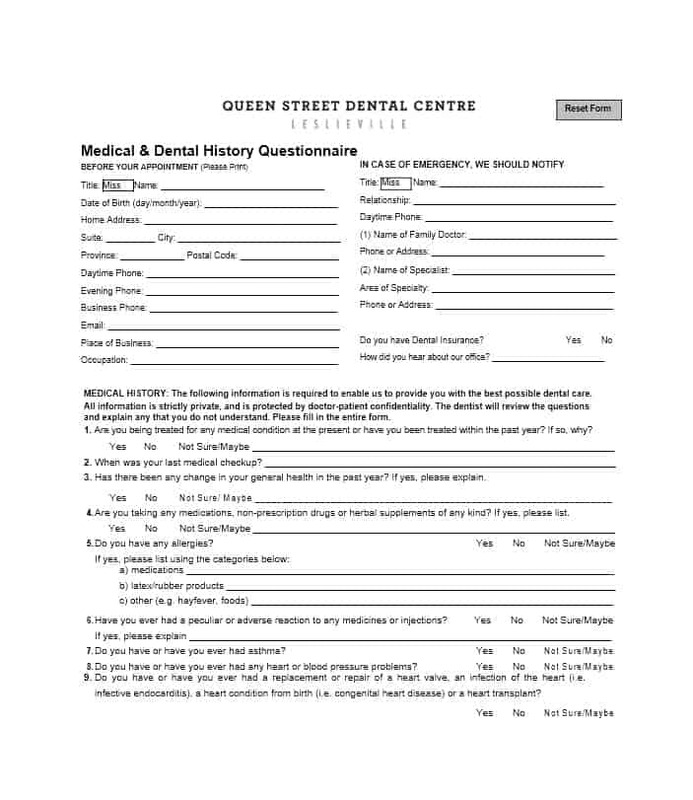 A number of factors affect the length and depth of the history-recording process, including the ability or willingness of the patient to contribute information, the purpose of the visit, the environment in which the information is recorded, and the urgency of the condition or complaint. 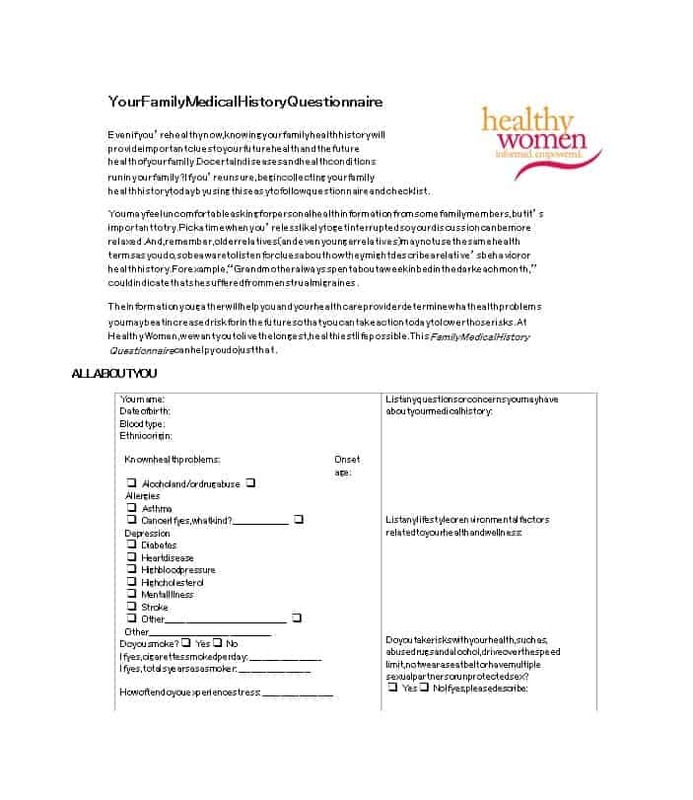 If circumstances allow, the healthy history questionnaire may become a comprehensive appraisal of all factors affecting the health status of a patient. However, in most cases, it’s a review of the most relevant factors. 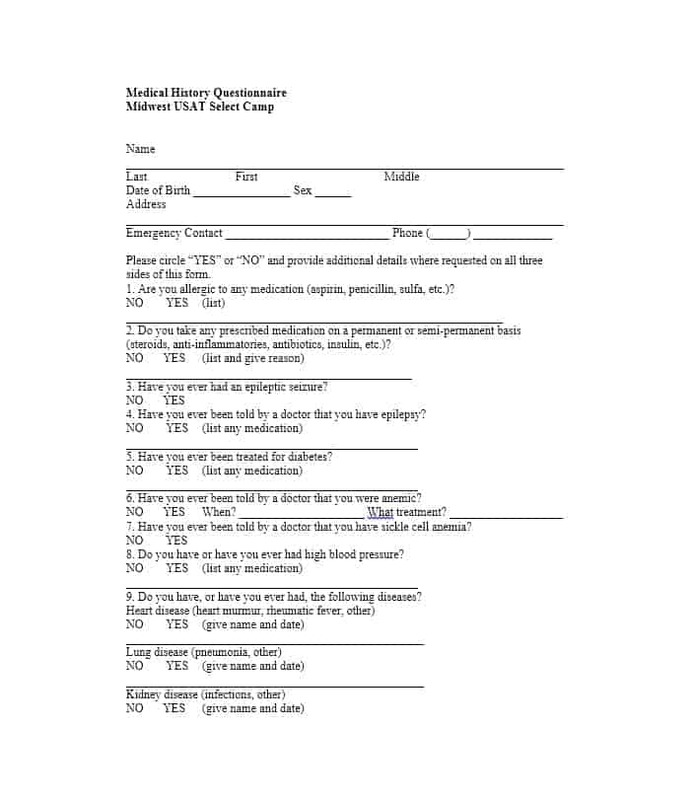 Once the aforementioned information is gathered, the questionnaire needs to explain in detail the reason for the visit. 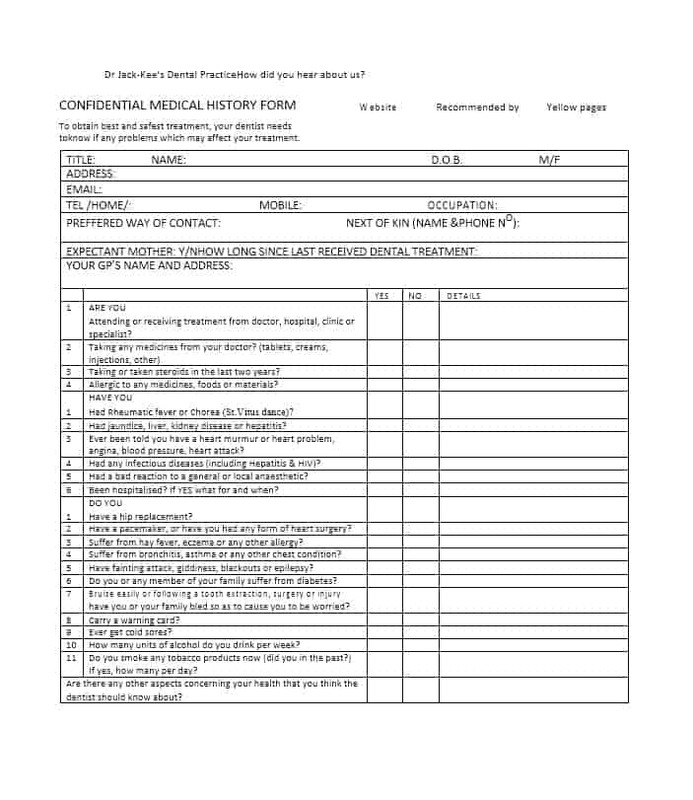 Often, the reason for the visit is marked as the presenting complaint, or chief complaint, in the medical history questionnaire. 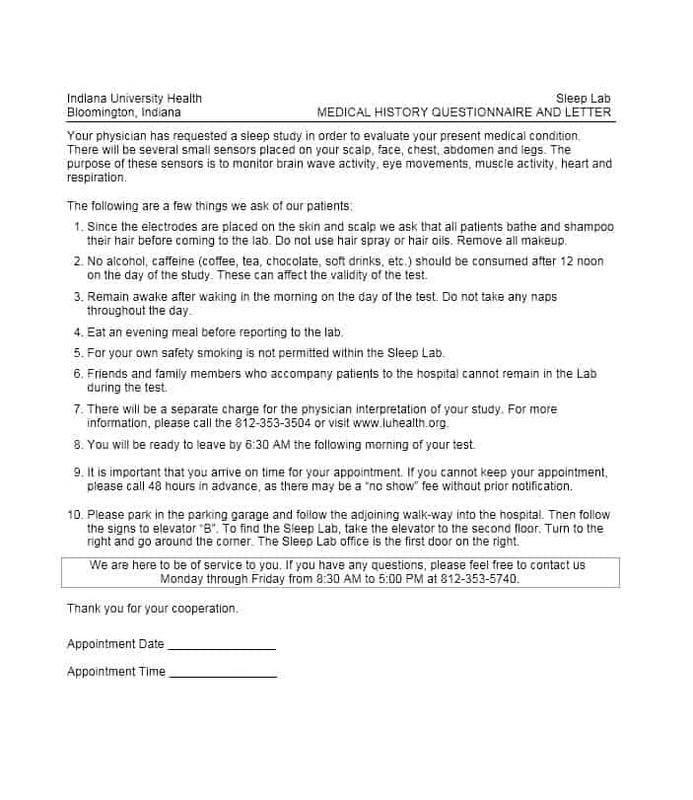 Once the reason for the visit is known, the next thing to obtain is a complete picture of the patient’s current medical situation. 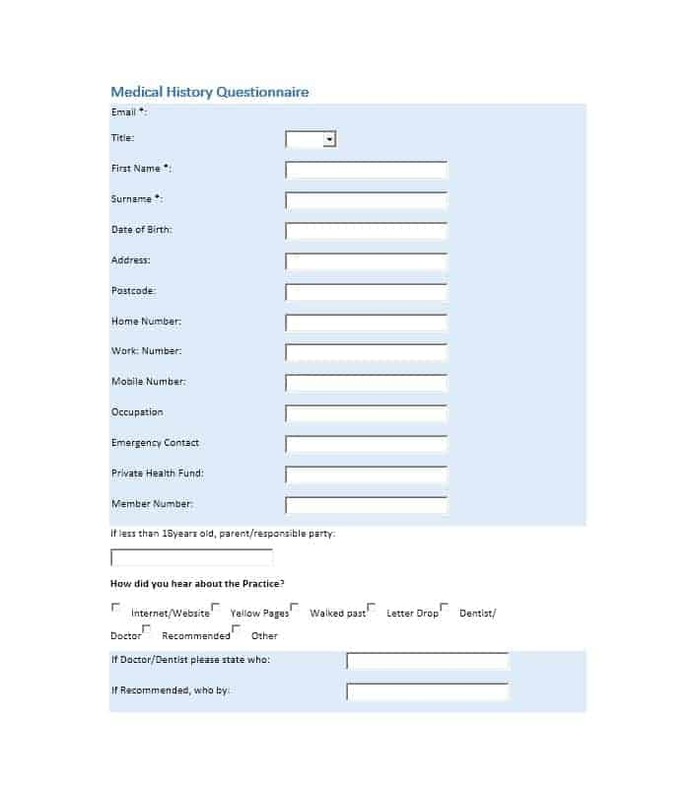 For example, if the patient is suffering from pain, the health history questionnaire should record aspects such as the pain’s intensity, location, associated symptoms, duration, precipitating factors, relieving factors, and aggravating factors. Often, the name given to the complete picture of the patient’s current medical situation is the history of present illness (HPI). 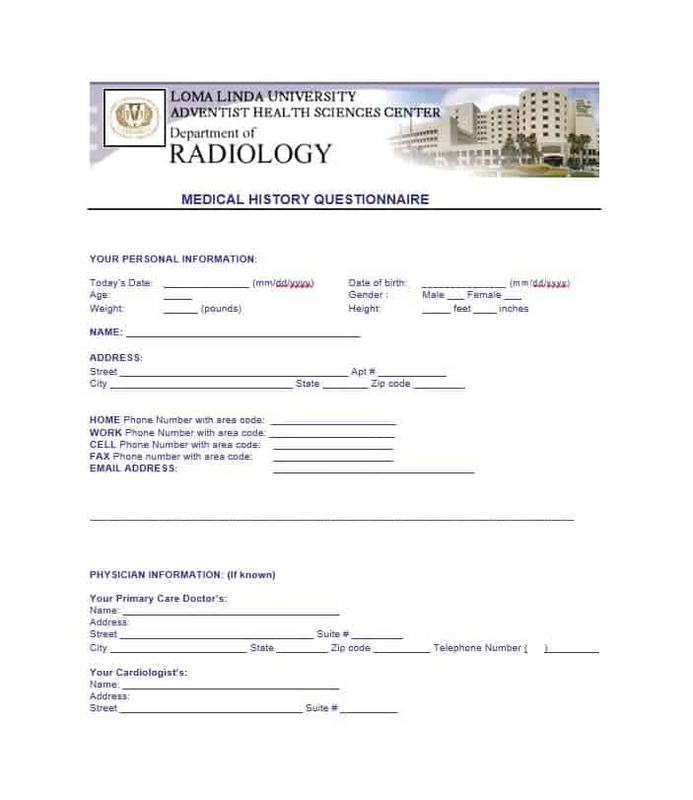 A useful way of collecting the relevant medical information in an organized manner is by reviewing the current and past medical experiences of a patient by asking him/her a series of questions. 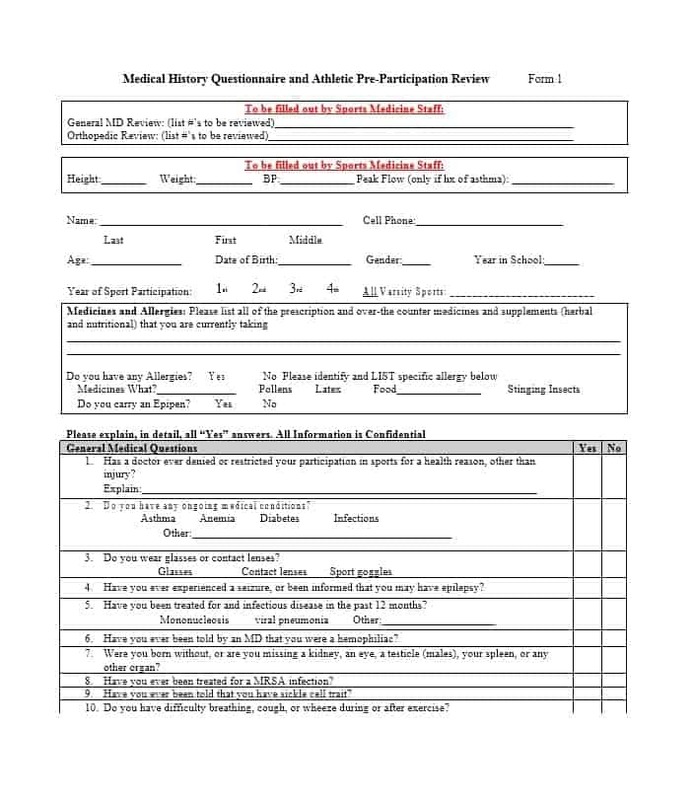 In addition to the above, the review of the current and past medical experiences includes information such as medications taken by the patient, illnesses, allergies, pregnancies, procedures, and hospitalizations. Also, it may include environmental factors, such as health maintenance habits and exposure to chemicals. 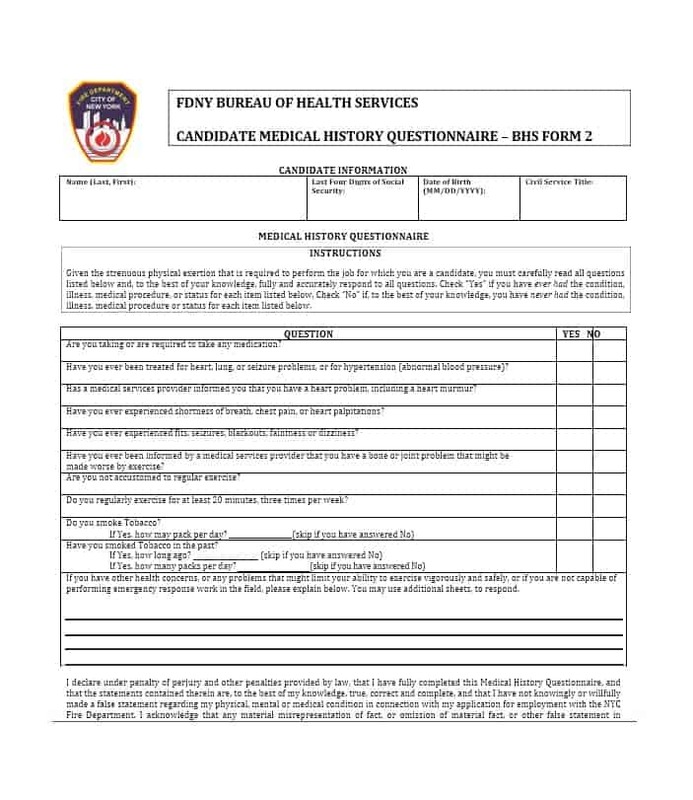 Immunizations or breast/testicular self-examination are some examples of health maintenance habits. Do you have any trouble hearing? 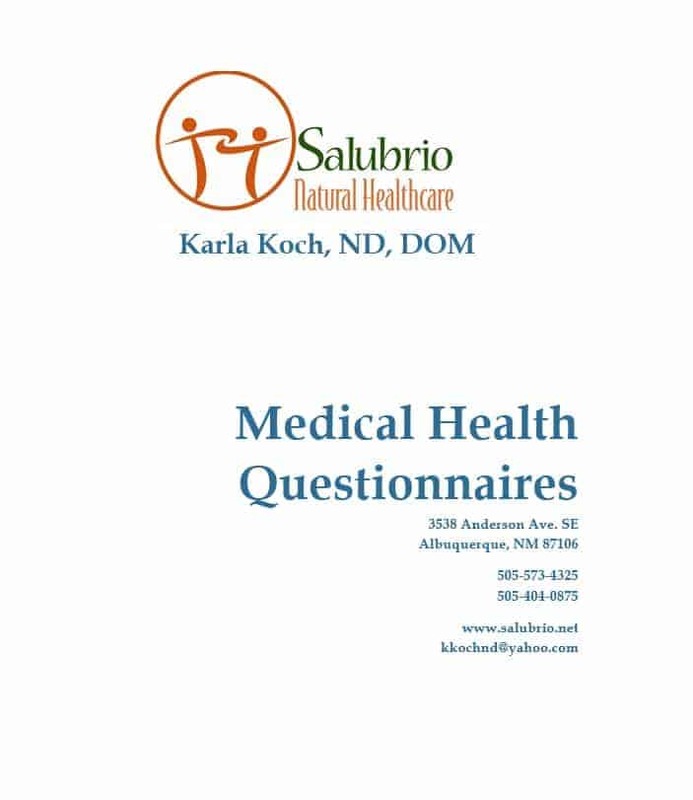 Have you ever experienced problems with your hearing or your ears? 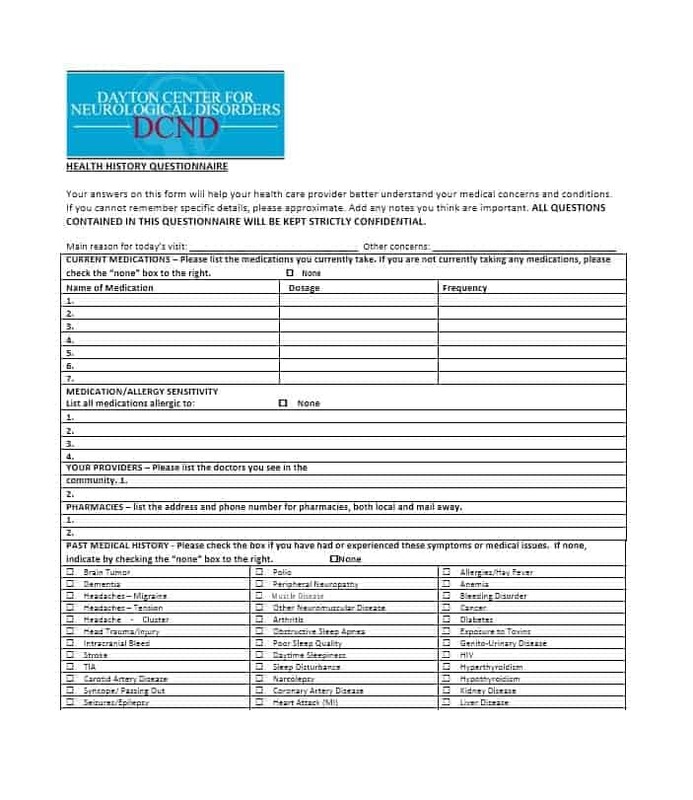 If the patient reveals that he/she has had a history of hearing problems, then further questions related to the procedures, surgeries, medicines or associated problems of the current/past condition will be asked in the questionnaire. 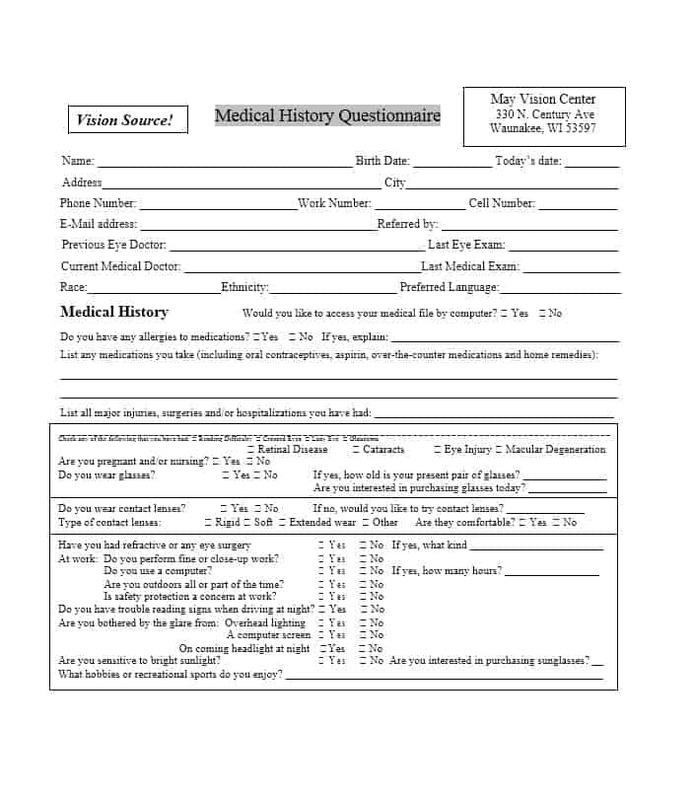 Taking a look at a medical history questionnaire template is a good way to find out what’s included in a medical history questionnaire. 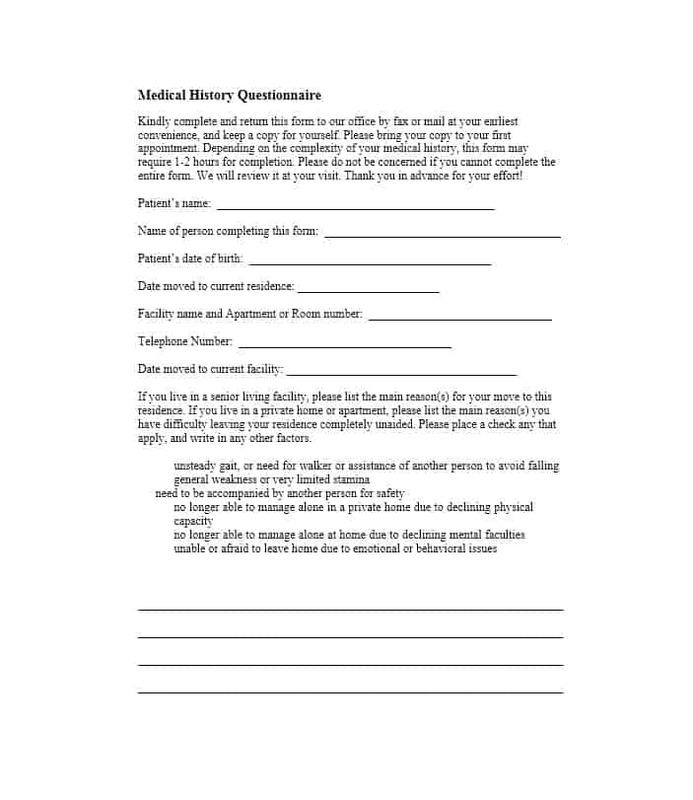 Talking about templates, you can easily create an emergency contact form or a medical consent form by taking a look at their respective templates. 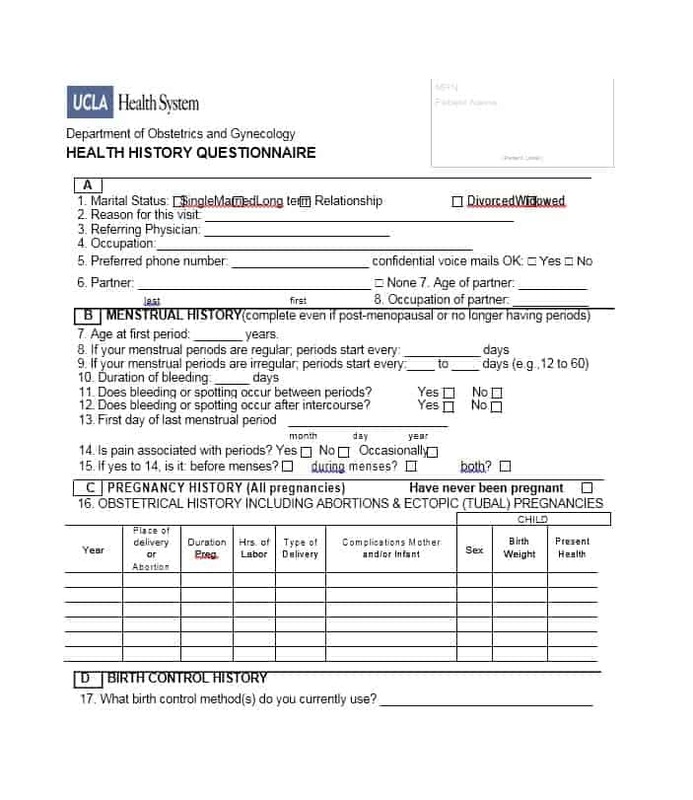 All health history questionnaires are not the same. 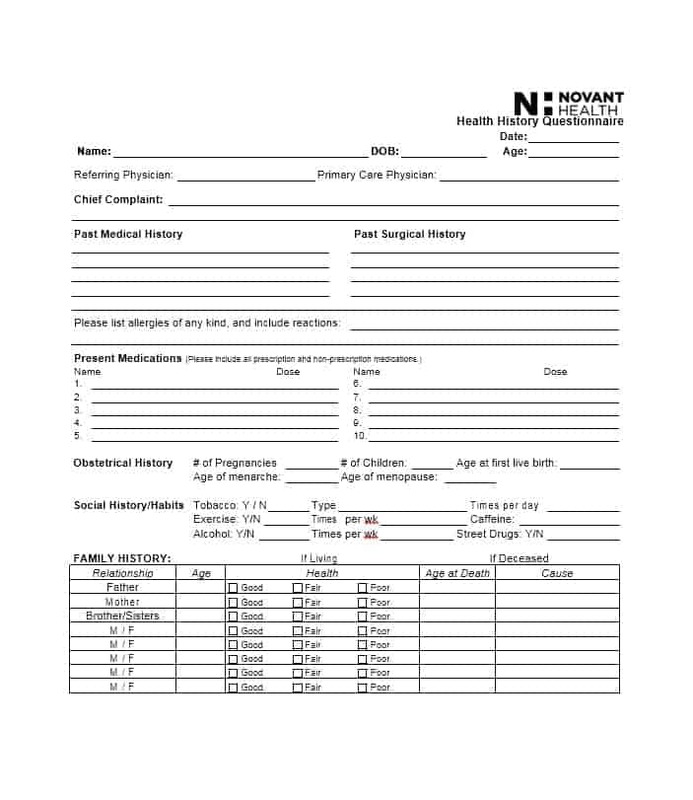 Medical practices customize the questionnaire based on the culture, age, attitude, and the educational level of the patient. 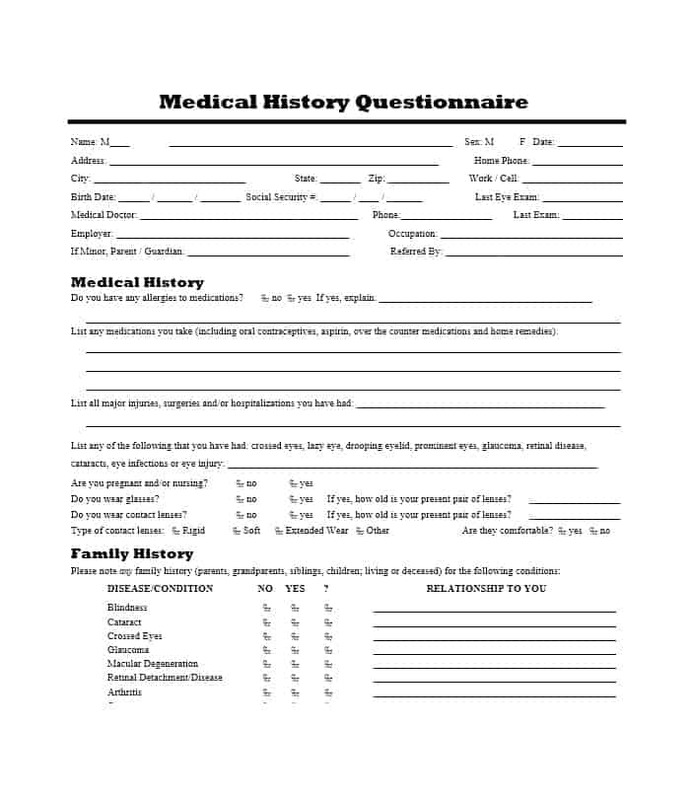 As mentioned earlier, a medical history questionnaire is often referred to as a family medical history questionnaire. 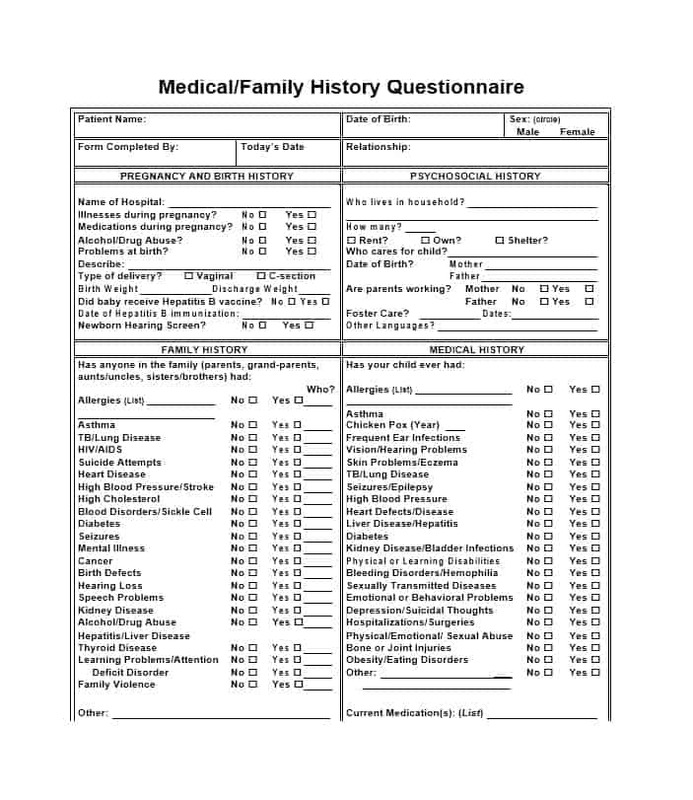 Wondering what a family medical history questionnaire is and what does it contain? Let’ take a look. 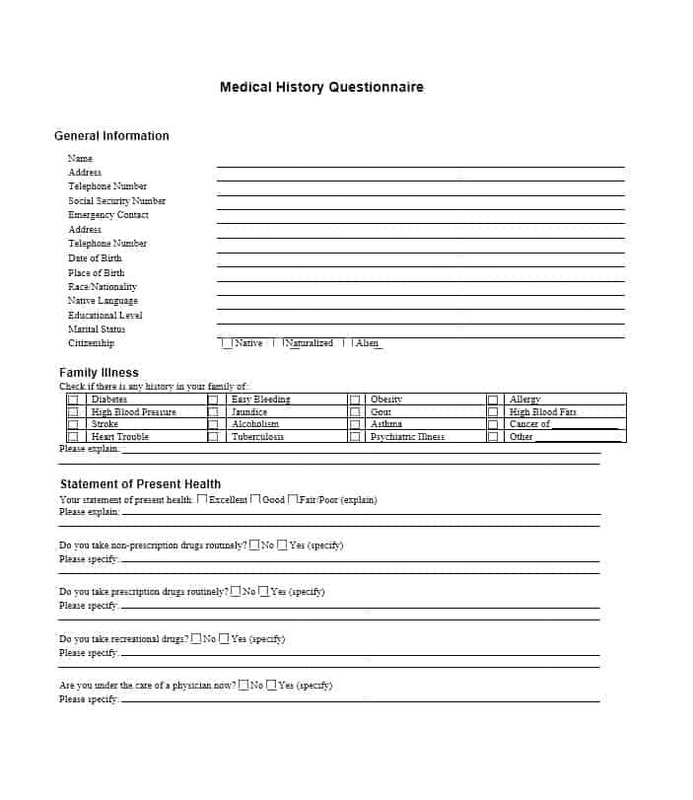 A family medical history questionnaire helps you find out what conditions run in your family and records any health conditions and treatments you or other people in your family have had. 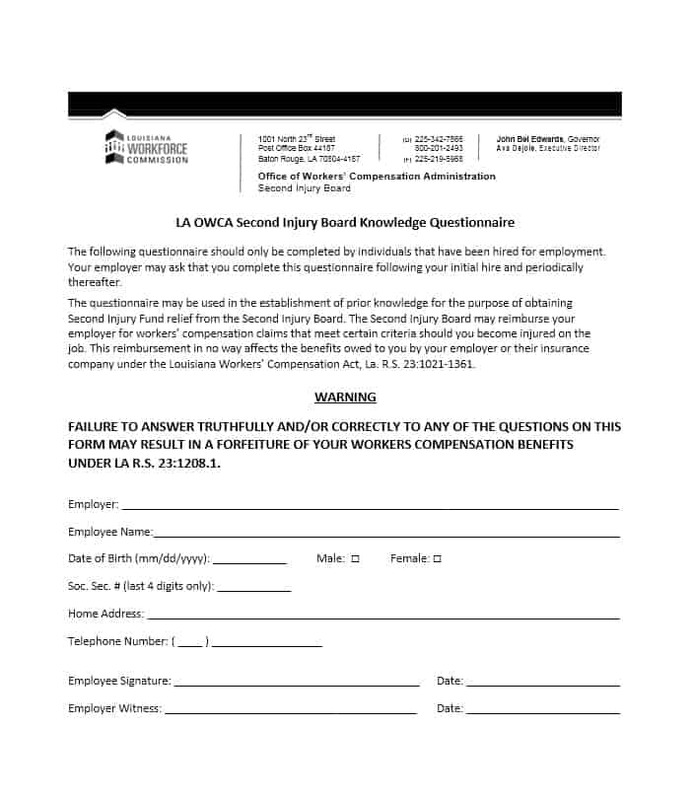 Also, it may record the conditions and treatments of your spouse and his/her family. 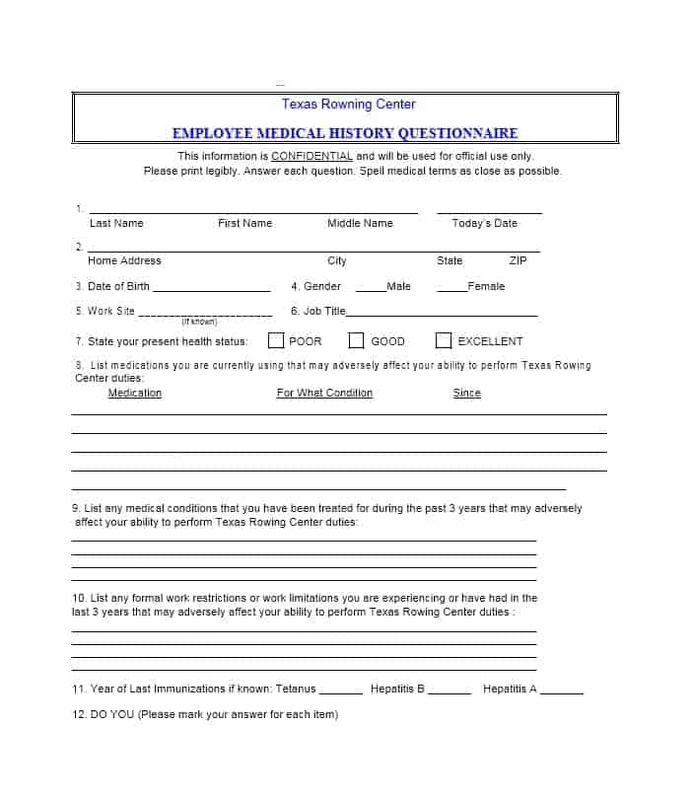 This allows you to find out the health problems that run in your family and may affect your unborn child. 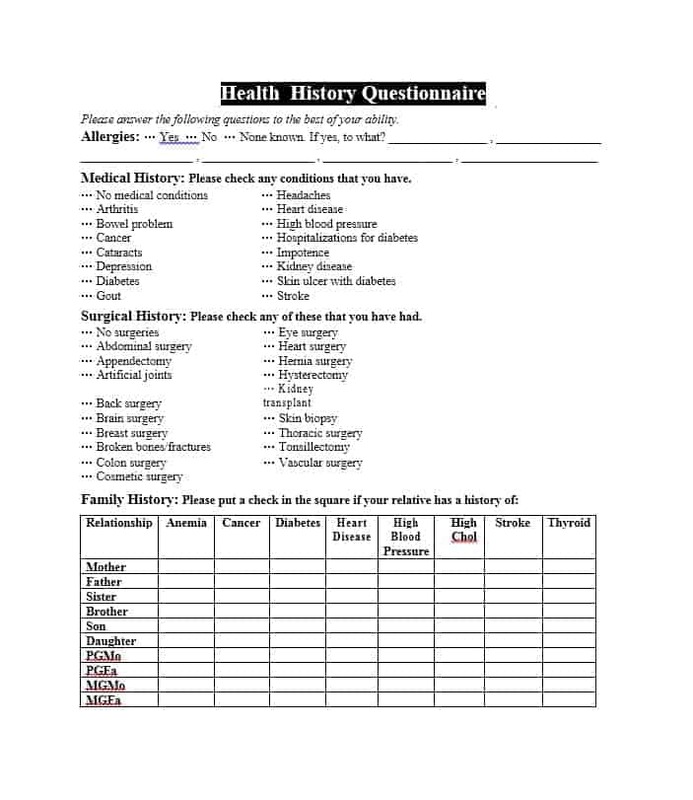 Recording the health history of your family can help you make important decisions related to your health. 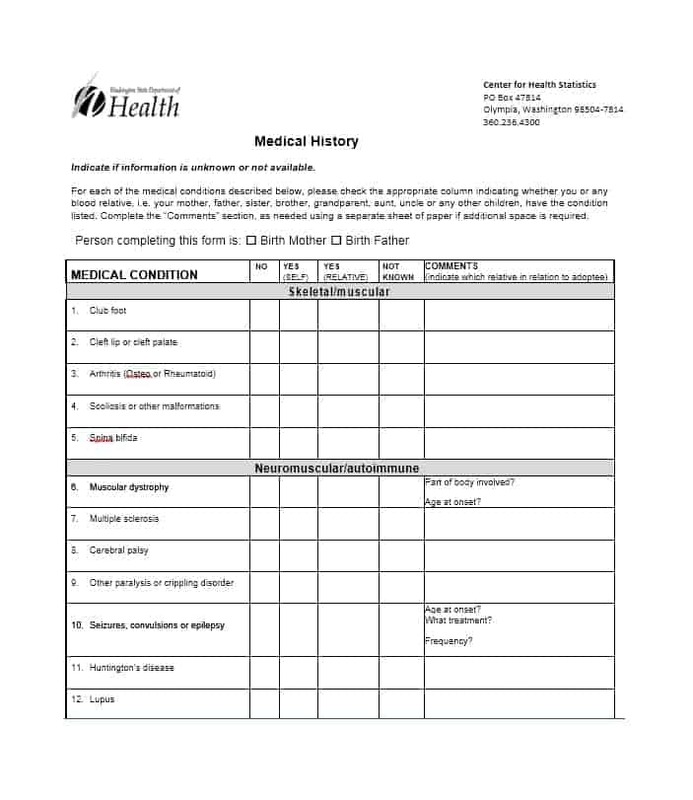 Even before your baby is born, you can learn about his/her health by looking at your family health history. 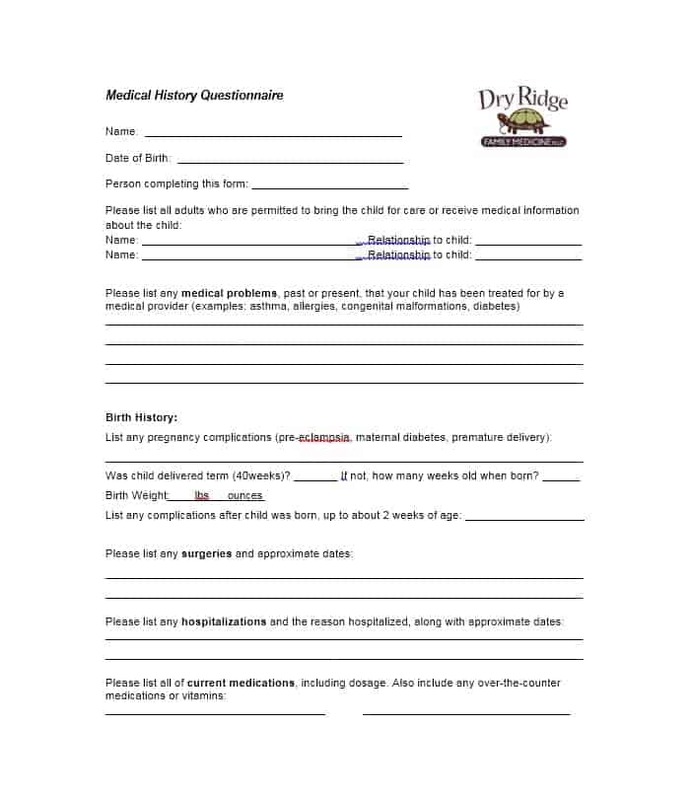 Also, by providing the information related to your family health history to your doctor via a family medical history questionnaire, you can make it easy for him/her to recommend appropriate treatments and care for your baby. 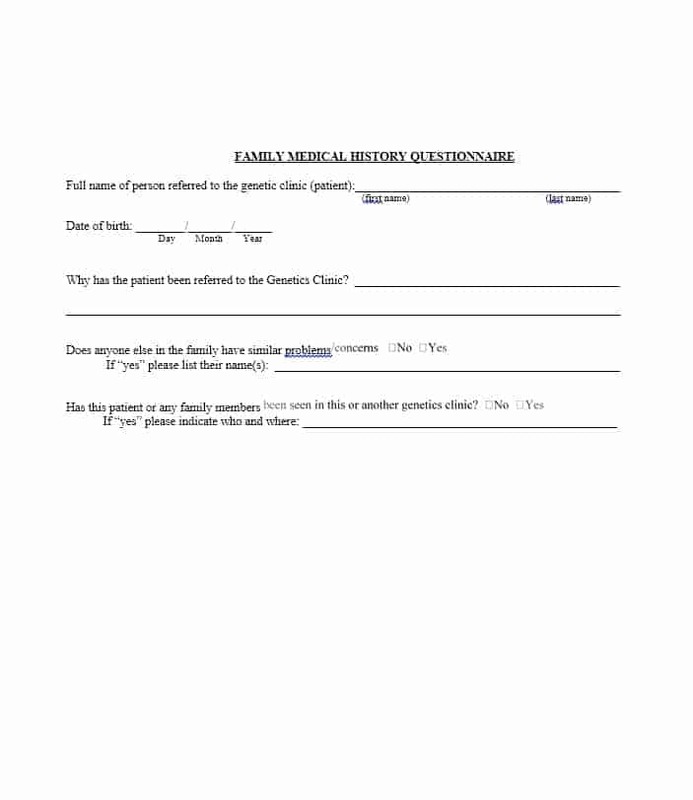 A great time to obtain the information required to complete the family medical history questionnaire is to do so at the time of a family gathering. 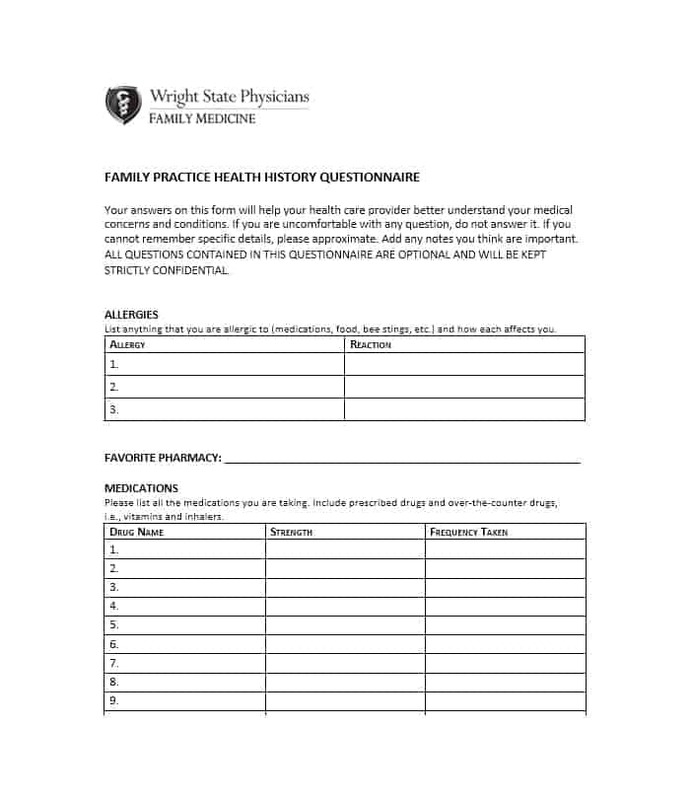 So, the next time you’re at a family event, make sure to ask your family members about their health histories. 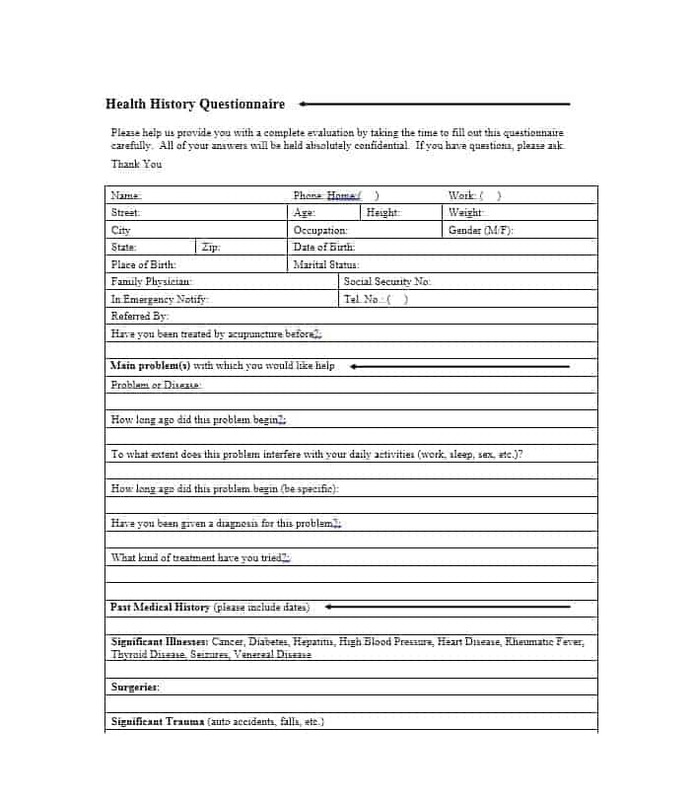 A health history questionnaire is one of the best ways to obtain a patient’s health history and get an idea about his/her health. 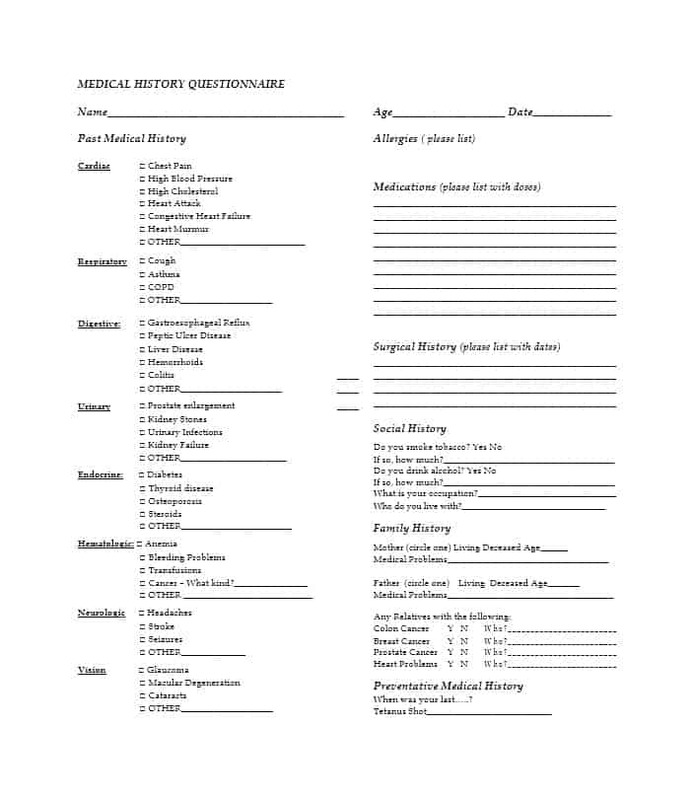 Additionally, the questionnaire can be used to obtain the patient’s family medical history. 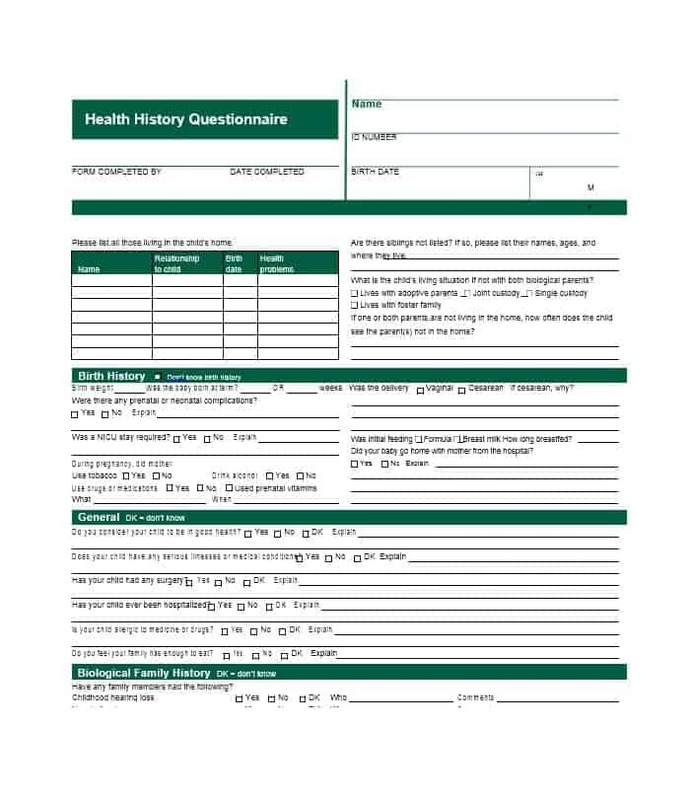 To know what exactly is included in a health history questionnaire, take a look at a medical history questionnaire template.